Tomorrow marks the beginning of one of the best times of the year: football season! A proud and time honored tradition for Cleveland Browns fans is the fine art of tailgating. Tailgating is just one part of the amazing experience football fans have when visiting the City of Cleveland and attending a Browns game. There are plenty of great places to tailgate around the City, but the most popular is in the Muni Lot. Below are some tips, expectations, and rules to abide by if you plan on tailgating in the Muni Lot. These tips will help ensure that everyone has the best possible football experience. Whether you are a diehard fan arriving prior to the opening of the Muni lot or a casual visitor just passing through, remember to help keep our City clean. 50 trash bins are located throughout the Muni Lot as well as 3 dumpsters. Please make sure all waste is disposed of properly before you leave the lot. A part of taking pride in your football team is taking pride in keeping your City clean and beautiful. The Muni Lot opens promptly at 7:00 am for all weekend home games. The fee to park in the Muni Lot is $20 dollars. Tomorrow, August 8th, Special Event Parking will begin at noon. There are 25 portable restrooms at the Muni Lot available during all regular season games. Football in Cleveland is very popular and every game draws many visitors and spectators from all over. Due to the high volume of people who make their way downtown for every game, we highly recommend that everyone allows for extra time on their travel plans. Leave early and expect to see some delays. The best part of tailgating is spending time with friends and family! So why not make plans to travel together? Carpool and select a designated driver as part of your pre-game ritual. Of course the best way to avoid traffic woes is by utilizing the public transportation options available to you via The Greater Cleveland RTA. As always, please exercise caution at large events and take the extra steps to be safe. The Division of Police reports that officers will be assigned to the tailgate detail for every Browns home game. 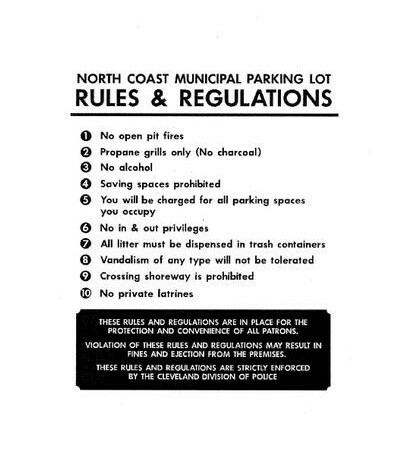 Open containers, consumption of alcohol and public intoxication are all prohibited in the Muni Lot. If you plan to consume alcohol during any sporting event always ensure you have a designated driver. Cleveland Browns football games are an amazing experience and great tradition in the City of Cleveland. Please enjoy them responsibly and treat all visitors and football fans with respect. And please remember that if you see something suspicious, say something to stadium security or police. Only 25 porta jons is a joke! if your gonna charge 20 bucks a car you need to accomadate your customers better than that. what do u as the city require some organization to supply for pottys with the attendance that will b at the muni tom. unfair! Money gretty city fathers!